Flossie Malavialle is a French born singer who has been based in the North East of England since 2002. 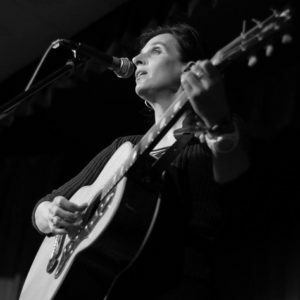 Several years on, she has become an accomplished performer playing at folk clubs and festivals all over the UK (and beyond) and supporting acts such as Fairport Convention and Show of Hands. Her collection of 13 albums (so far) is a reminder of how much work and dedication she has put into her music career: from well established folk songs to jazz standards, from blues numbers to Edith Piaf and Jacques Brel’s classics, her wide répertoire appeals to all. Scroll down to listen to one of Flossie's latest tracks "Girls' night out" by The Judds. "I first got involved in the British folk scene in 2000-2001 while I was on a teacher exchange in the North East of England. After 12 years of teaching English full time in secondary schools in the South of France, I decided to apply for a job as a French teacher in England, as I felt it would boost my English to live abroad for a year. I ended up working in Stockton-on-Tees whilst living in Darlington (great part of the world to improve on your English, like). As I had been singing for years in France before that, I found it quite natural to turn up at the Darlington Folk Club one night to meet the locals and sing a song... I didn’t realise then that this was going to be the beginning of a new life in England for me." "After my exchange was over, I went back to France but missed my life in England so decided to come back! I am now based near Bishop Auckland and am 100% focused on my singing. I have released 13 albums since 2002, all covers of songs that I like and relate to. See the shop page for more details on these." I also love lively songs such as Willie Nelson's 'On the road again', Kris Kristofferson's 'Bobby McGee' (Janis Joplin way) or The Judds’ 'Girls’night out'. There's also space for lovely ballads such as 'Georgia on my mind' or Frank Sinatra's 'Strangers in the night' as well as jazzy tunes like 'Let's fall in love', 'Misty' or 'Fly me to the moon'. So even if you have never seen or heard me before, I’m confident there will be something in my répertoire to suit your taste! I'm making new friends wherever I sing and am looking forward to seeing you at any of my concerts soon! Check the gig list for concerts in your area...and beyond!"